in a wide range of asset classes. tures, options, derivatives and use of leverage. Put systems & CTAs you want to track into a watchlist for easy future viewing. 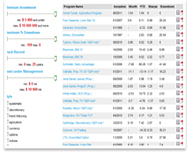 Keep tabs on your favorite programs by using VEREMARKET Watchlist tool. See up-to-date performance online; or set alerts to receive email notifications when your favorite programs post updates. The Watchlist will automatically update the performance numbers of CTAs, show the days of profit or loss for trading systems, and give you quick access to more information on those investments. 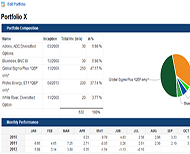 Get Advanced Stats such as Sharpe Ratio, Winning Months and much more. 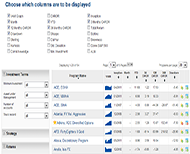 Use VEREMARKET Performace table to customize view by nearly any statistical measure you like. Risk adjusted ratios, money under mamangement, average DD, avg length to recovery, avg losing month, total return, and much more allowing you to compare programs on the stats that you care about most. Use VEREMARKET's Portfolio tool to track investments you already have, or to track the performance of hypothetical portfolios. Change amounts, and even allocation dates of managed futures programs in your portfolio, and see historical returns and current value.